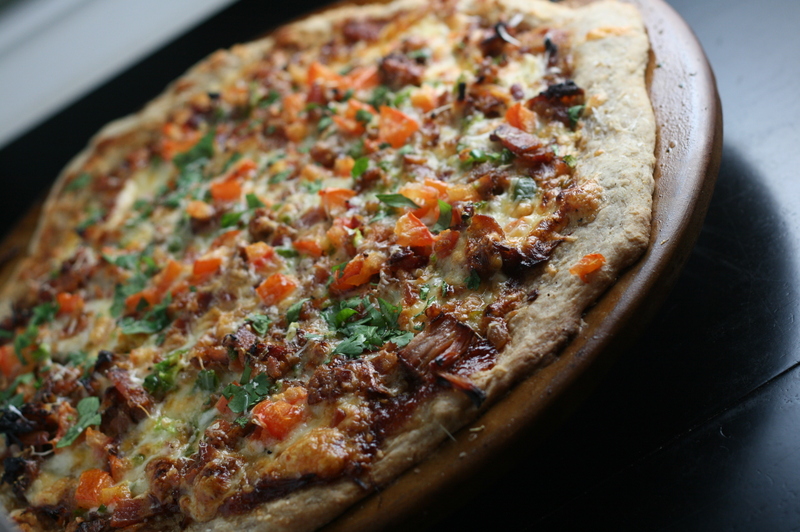 Pizza + Pulled Pork. Genius. Pizza dough is easy. Say it with me. 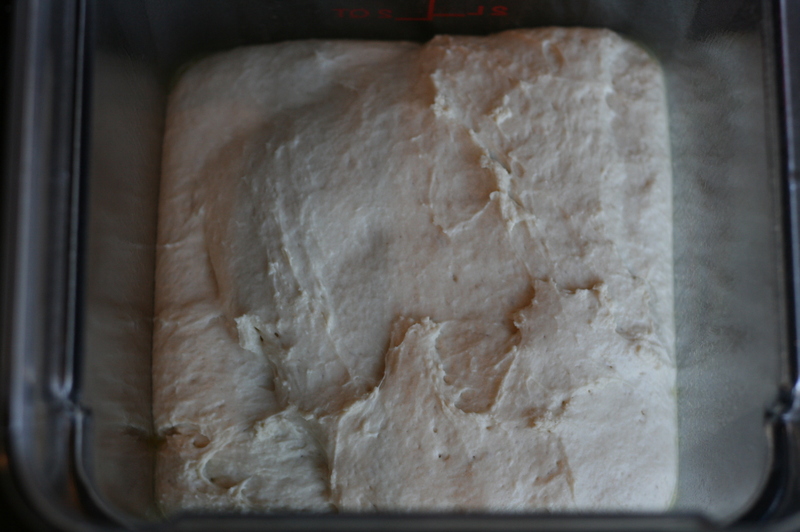 Homemade pizza dough is easy. Dough makes people nervous unless it’s in the form of $10’s, $20’s or better yet $100’s. Is it the yeast? The rising? The kneading? Making bread is not instantaneous but it is easy and way tastier than the stuff in the freezer section. Baking bread is one of my favorite cooking tasks. It’s low maintenance. You mix up some stuff leave it alone. Go back pay it a little attention then leave it alone again. 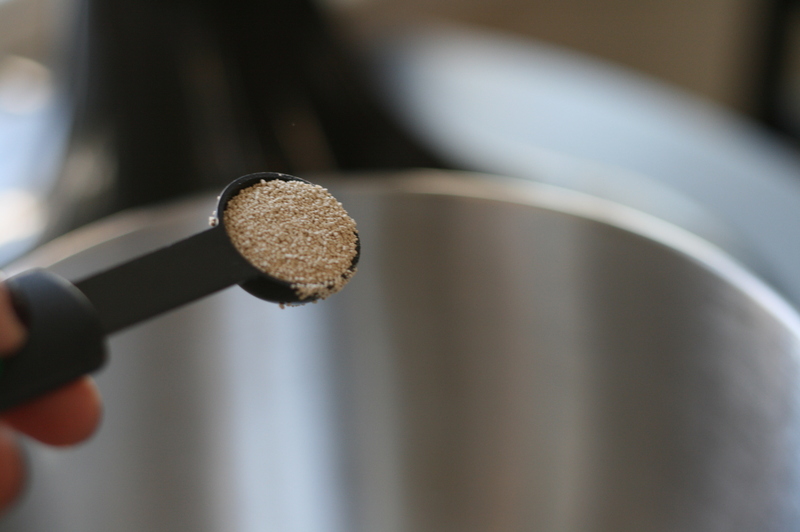 You aren’t sweating over a stove stirring for hours. Here’s our cast of characters for this story. Yeast. Flour. Salt. Honey. Cornmeal. Olive Oil. A thermometer. A pizza stone. That’s it. And a mixer. 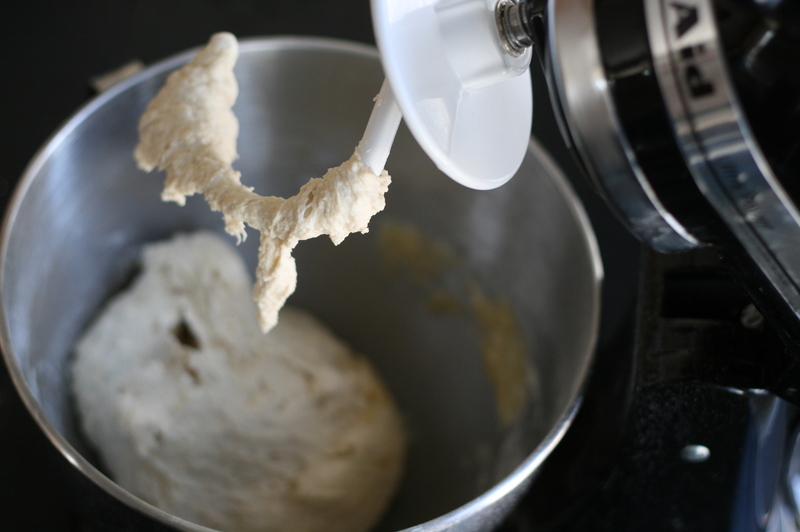 Attach the Captain (Dough) Hook. Hook attachment that you probably took out of the box, looked at and said "huh?" and stuck it in the cupboard. You get to use it!! 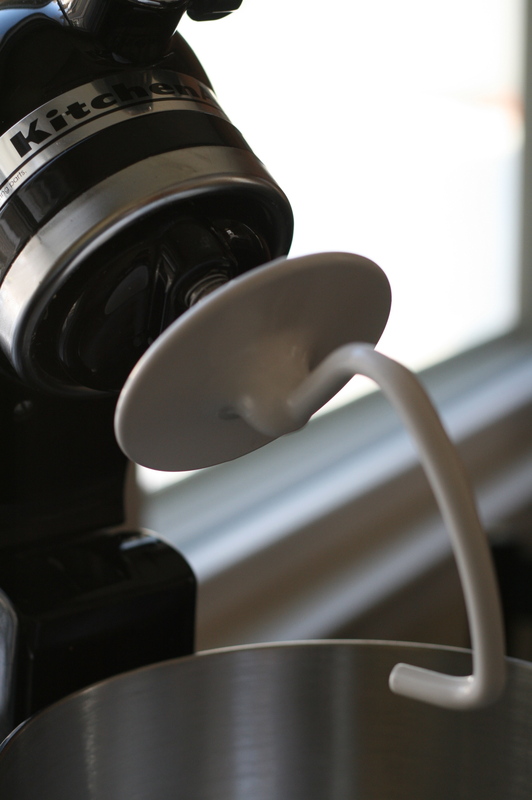 If you don’t have a mixer, you can knead the dough by hand. No big deal. For this recipe, I turned to one of my favorite cookbooks. 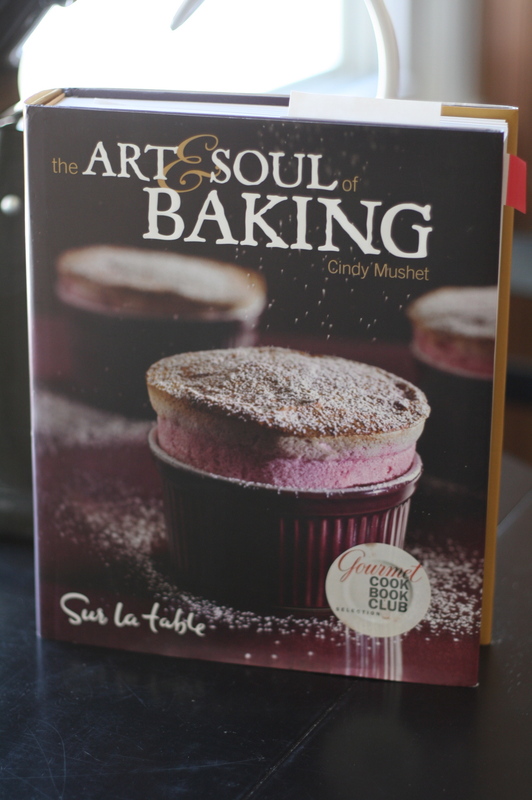 The Art and Soul of Baking by Cindy Mushet. I don’t make a ton from it but as a cooking weirdo, it’s one of my favorites to sit and read. Really. I would not divulge such a geeky trait if it weren’t true. I read cookbooks like novels. 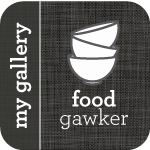 Amazing (sounding) recipes. Great explanations of how baking works. Beautiful pictures. 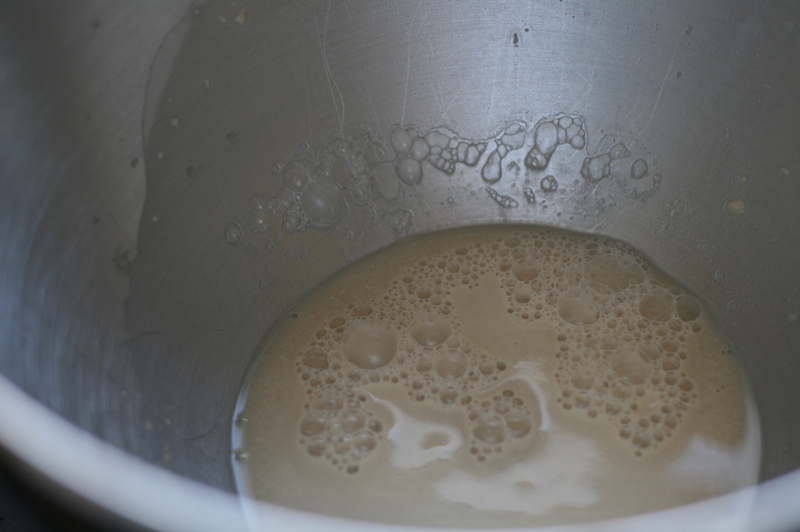 Yeast is a living organism. You won’t see it move but it does need to prove it’s working for you. 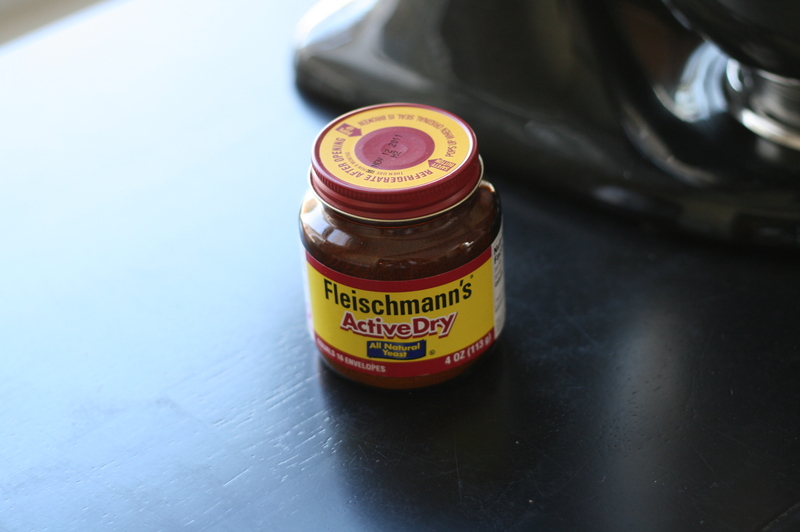 To get the yeast all excited about its job, you have to get it activated. Warm water (between 100-115 degrees) is the first trick. Cold water won’t activate it. Water too hot will kill it. Don’t murder your yeast. Make sure the water is between 100-115 degrees. Off to perform its first trick. Whisk it together and then leave it alone for a bit. Go fold some laundry. Starting to bubble. Yippee. It will smell all "yeasty" too if you stick your nose in the bowl. This is IT! Hopefully you can see that it's thicker in substance. Creamy looking. We're ready! 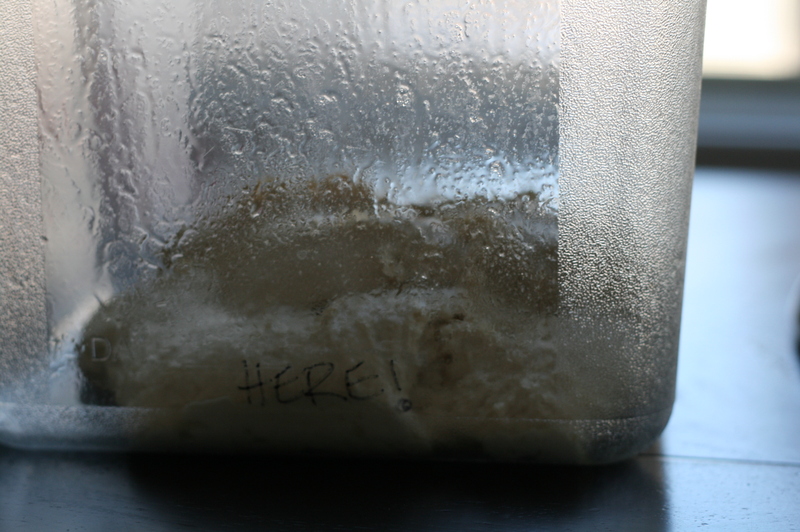 So now we have active, happy yeast ready to go to work. 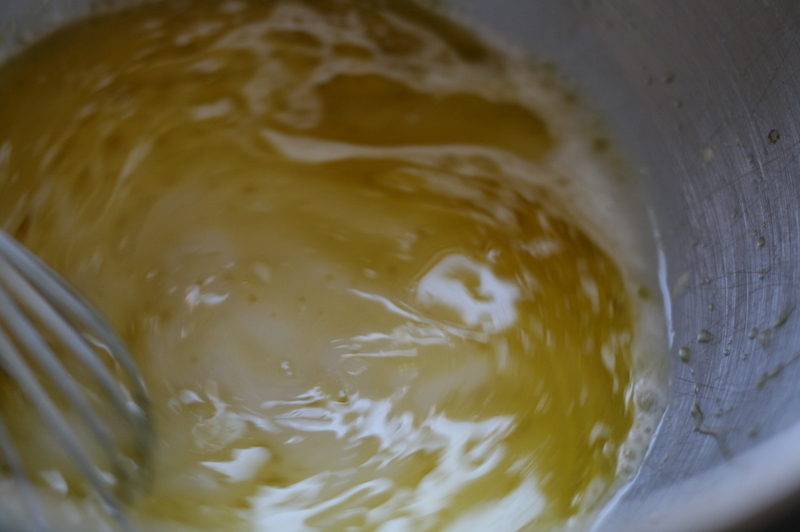 Whisk in 3 tablespoons of olive oil and 1 cup water. Whisk! Whisk! 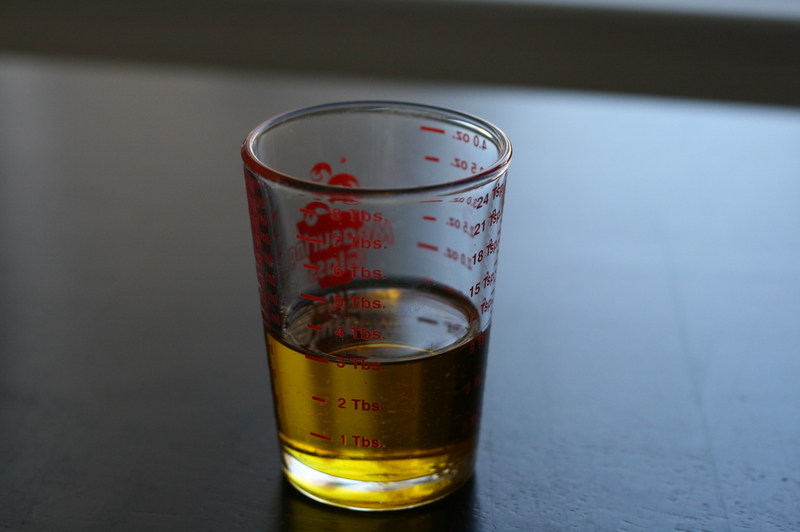 I also love these little shot glass measuring things. 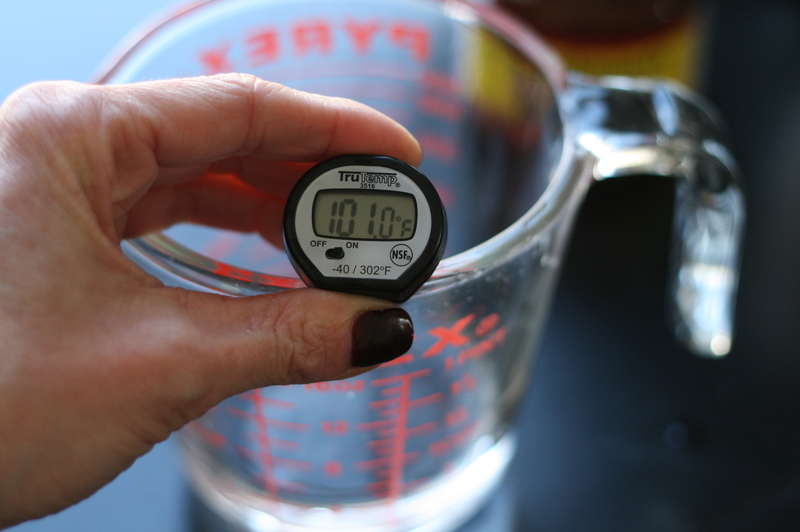 Makes measuring small amounts, like teaspoons and tablespoons, of liquid easier. 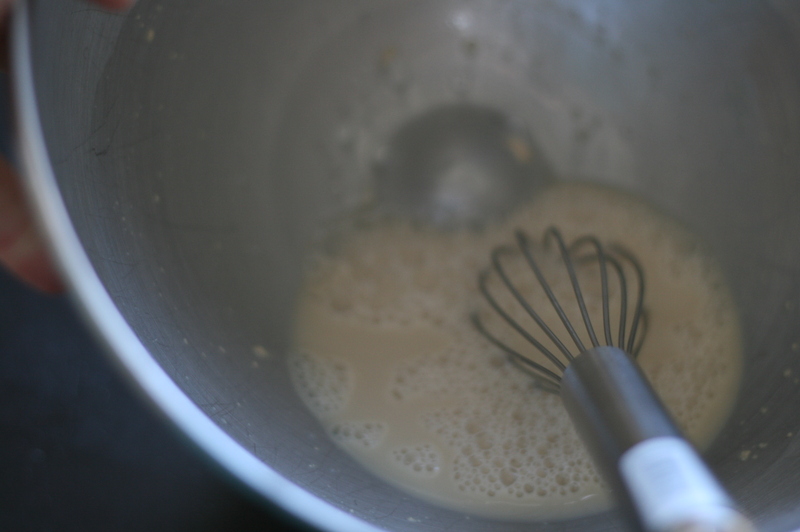 Whisk olive oil and water into yeast mixture. 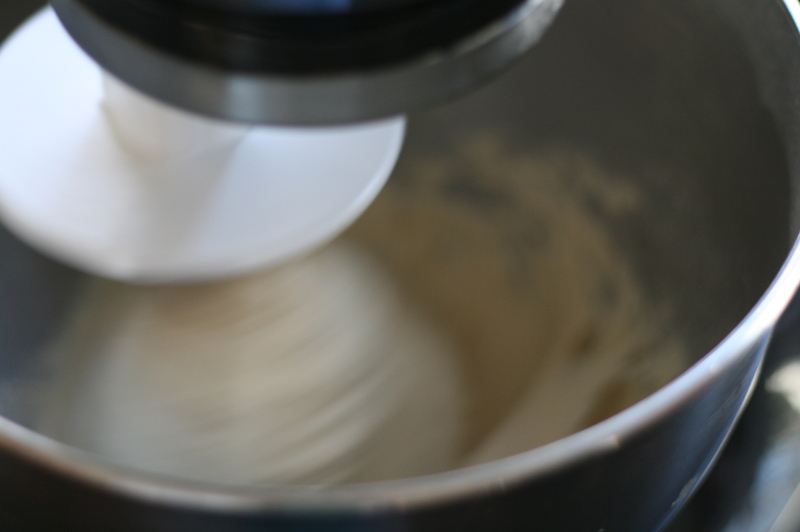 Add the flour and salt and using the mixer, knead the dough on low speed (number 2 on your Kitchenaid) for about 2 minutes. It will come together in to a ball. I need a Mixer-Cam. It's tough to get in there to show you all the action. 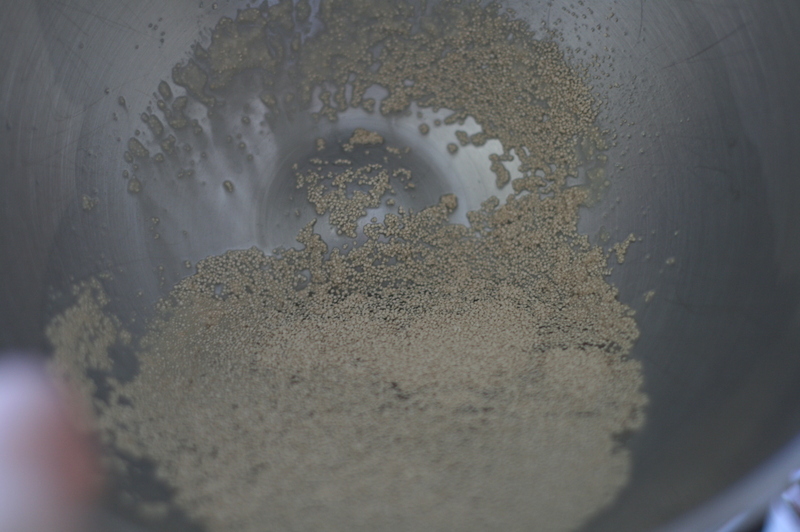 Now our yeast is exhausted, it has worked really hard up to this point. Give the little guys a break. Cover the bowl (plastic wrap or lint-free towel works) and let the dough rest for 20 minutes. This allows it to fully hydrate before we beat it up all over again. Now you can go feed your kids lunch. Take a power nap. Making dough/bread is very multi-task allowing. 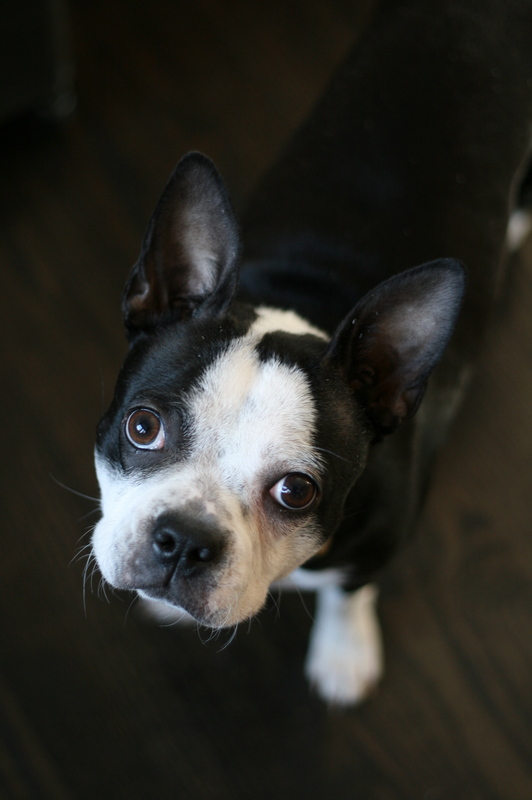 I used my 20 minutes to play with Maggie who was waiting patiently find out if there was bacon eventually involved in this recipe. Yes, Maggie bacon is later. Patience. 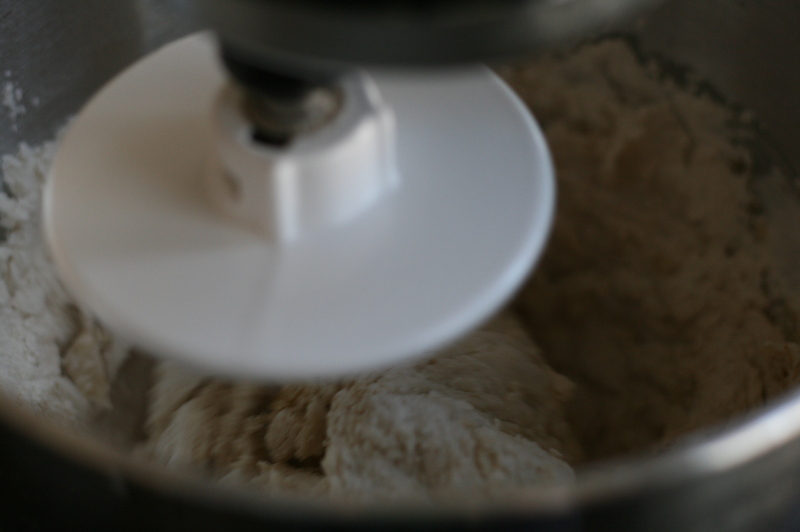 Now that everyone is rested, knead the dough on medium-low (about number 3 or 4 on your Kitchenaid) until it is firm, elastic and smooth. About 3-6 minutes. I found it was still quite sticky so I tossed in a few more pinches of flour and it came together. 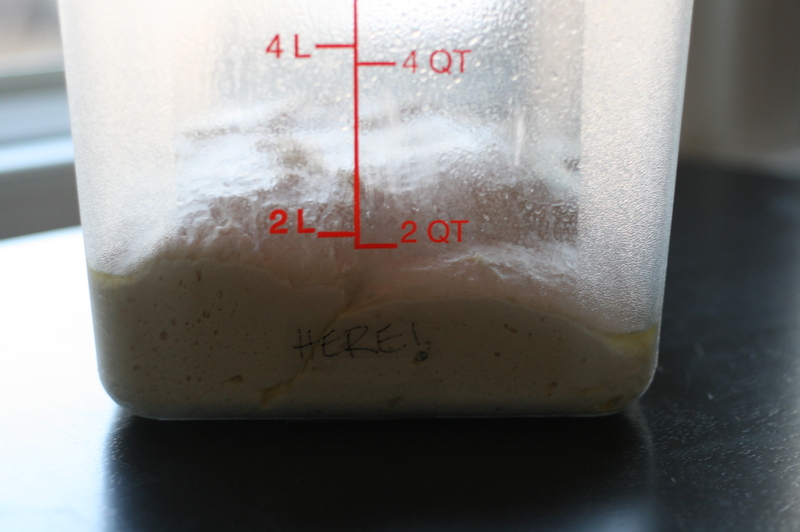 Now the dough has to rise (proof), the yeast really wants to impress you and show you what it can do. 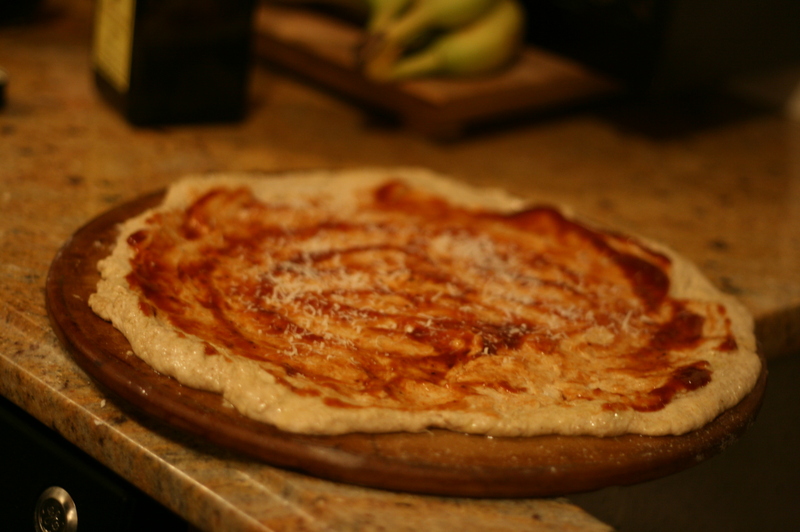 If you leave it alone for awhile, it will prove its worth and double your dough in size. Great tip from the cookbook: Mark with a piece of tape where your dough started, that way you will know whether it is rising and doubling. Given the size of my container, it's not the most accurate tape placing. The container is greasy looking because you want to coat it with some cooking spray or olive oil. 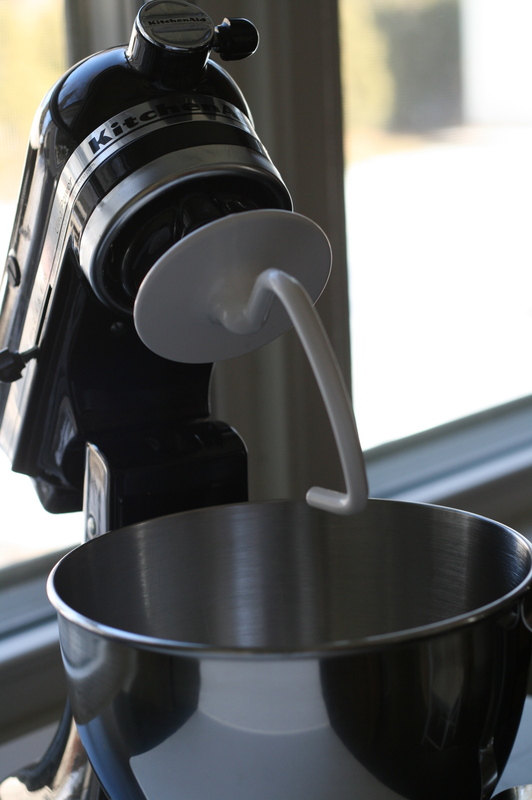 Scrape the dough from your mixer bowl in to a container and cover tightly with plastic wrap or your lint-free towel again. This time you get about 45 to 60 minutes. I probably did some thing like wrote a dissertation on world peace or re-insulated my attic. No, in actuality I probably watched an episode of Real Housewives or played Uno with my son. Ohhhh, lookie lookie. It’s doubled! We are ready to make pizza!! 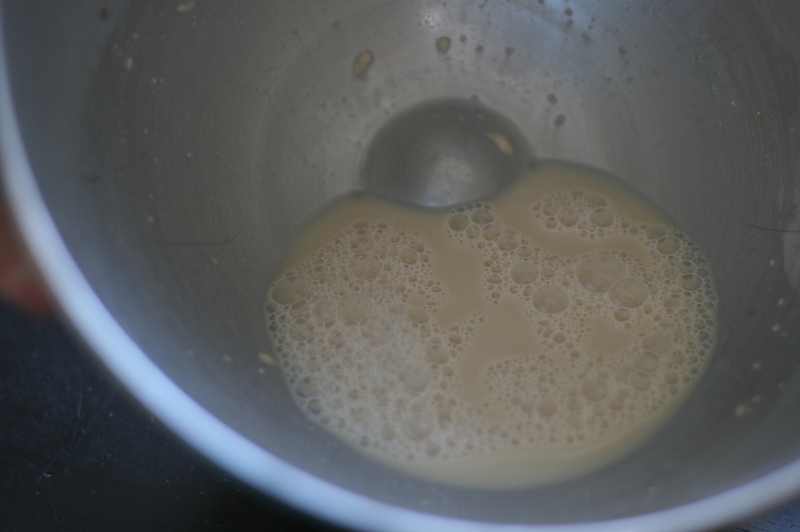 Or at this step you could divide the dough in half (use a little flour- it will be sort of sticky.) and freeze half of it or all of it. 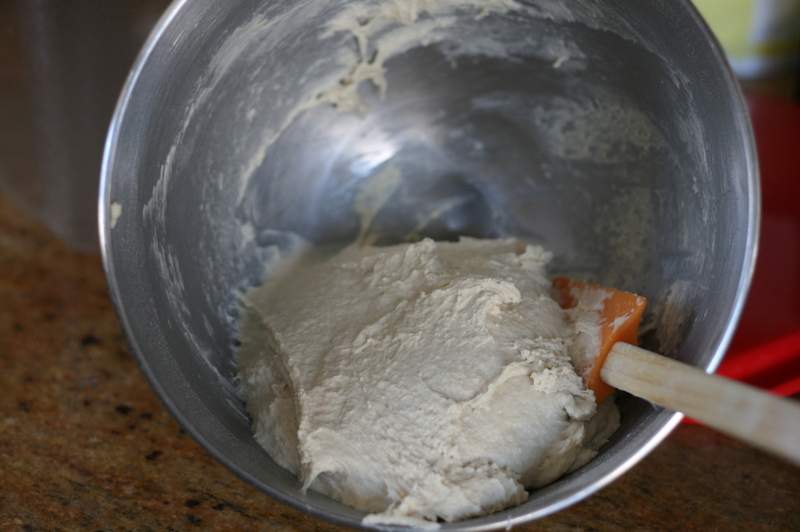 The dough will keep in the refrigerator for about a day so you can make the dough when you have time and then use it tomorrow. Beautiful. We brought out the bacon and some pulled pork. Memphis style pizza. HoooWeee. I made some pulled pork last month and froze it (of course) so that was the catalyst for our dinner. I do a Barbeque Chicken pizza that is similar to this ingredient list. 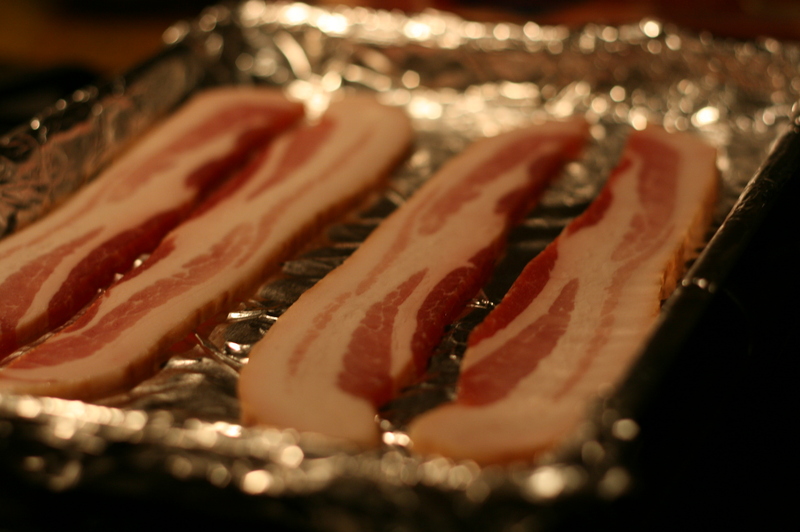 Applewood Smoked Thick Bacon. My new favorite friend. 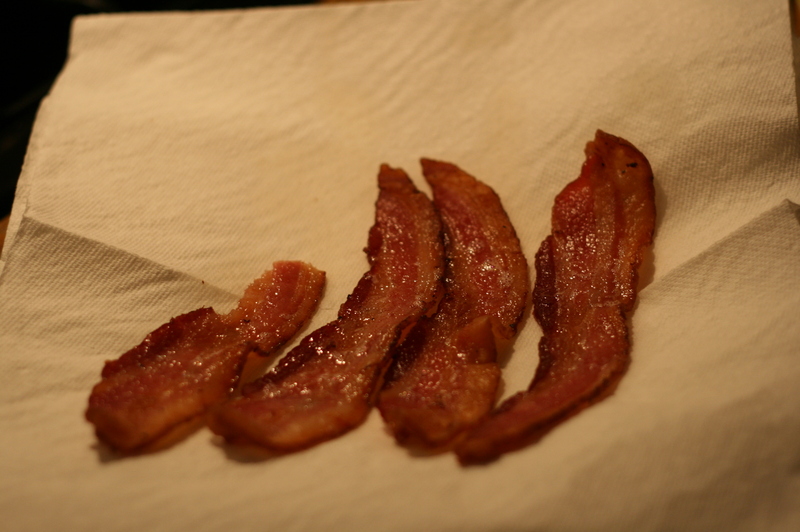 I bake my bacon at 425 degrees for about 8 minutes- flip it over- bake for another 4-5 minutes. I hate the grease mess of cooking bacon on the stove. Wait a minute. Half of that piece of bacon is missing? Hmm. Dice up the bacon. Prep your pizza dough. If you don’t have a pizza stone, just use a baking sheet. Preheat the oven to 500 degrees. 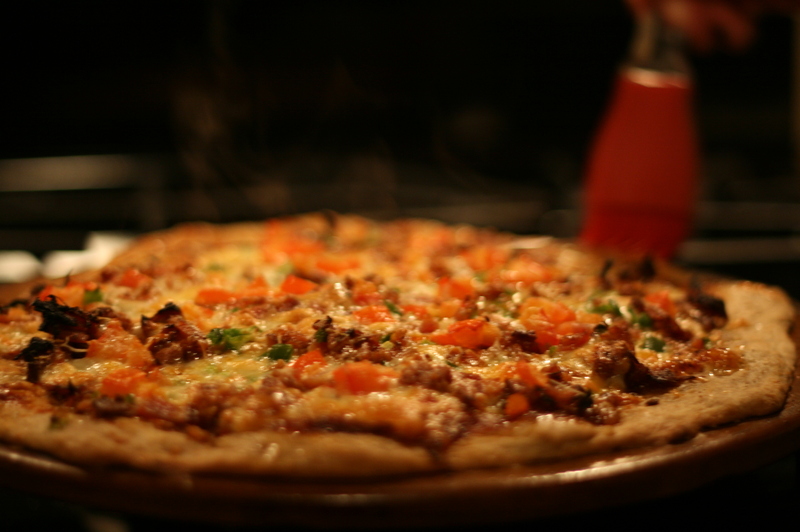 The key to good pizza at home without a $100,000 wood fire pizza oven is to get your oven as hot as it will go. Most home ovens will go to about 500 without exploding. 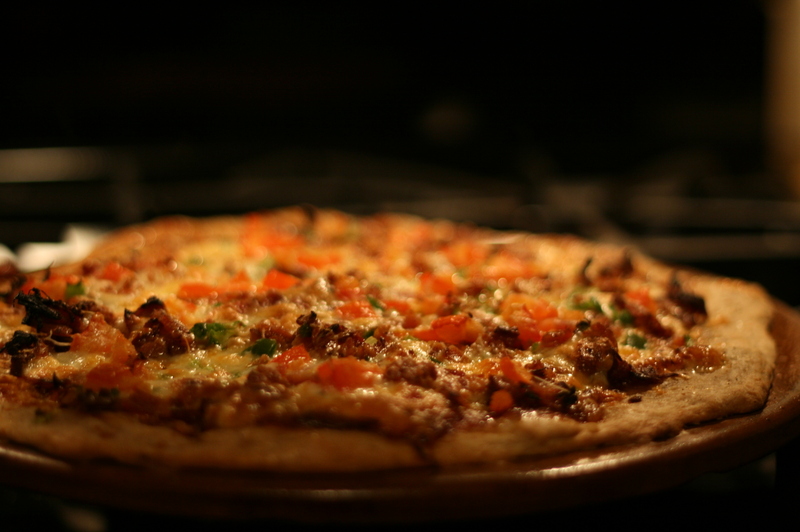 If you have a pizza stone, preheat it in the oven as every recipe recommends. I will be honest, I don’t do that. I don’t think I am coordinated enough to slide the pizza from some source (like a pizza peel or parchment paper) on to the 500 degree pre-heated stone. The thought of cleaning up pizza that flopped off the paper on to the bottom of my stove gives me hives. One day, I promise I will try it and tell you all about it..when I am braver. Or have a housekeeper. I prep my pizza on a cold stone and then bake it. Seems to work just fine. Sometimes I precook the prepped dough for about 7 minutes, pull it out and then finish topping the crust with my other ingredients. 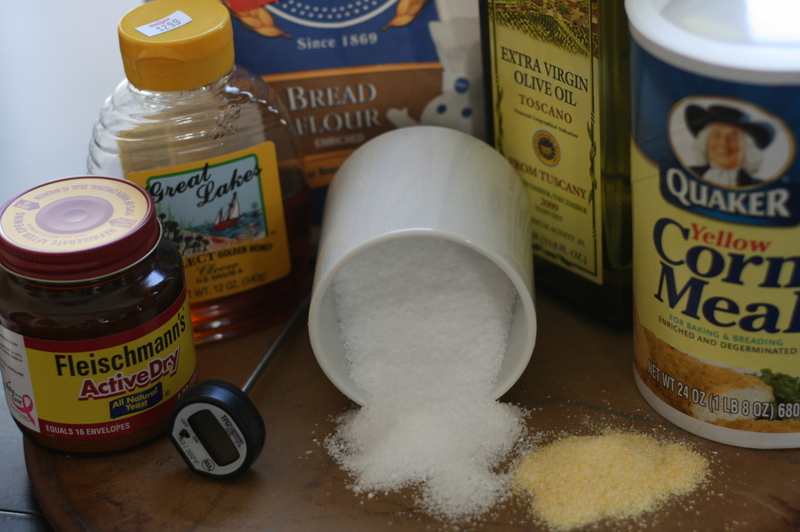 Sprinkle the stone with a little cornmeal and then shape your dough. 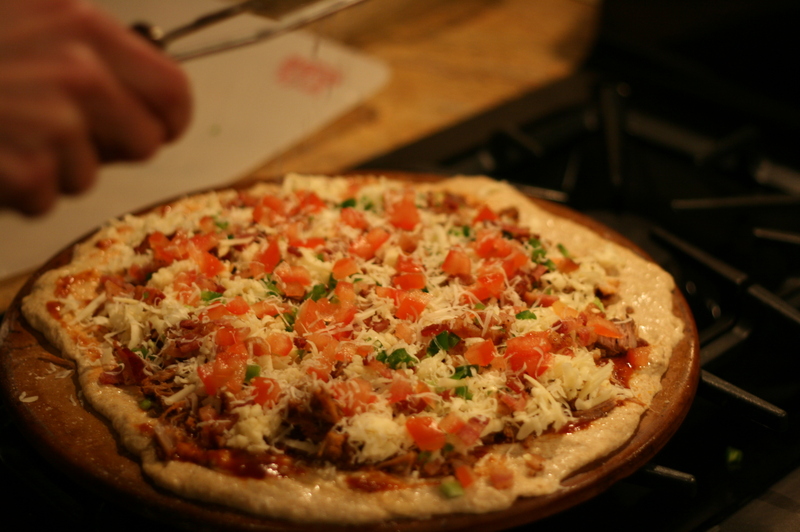 We used barbeque sauce as the base because we're going Memphis style with this pizza. The white flakes are parmesan. 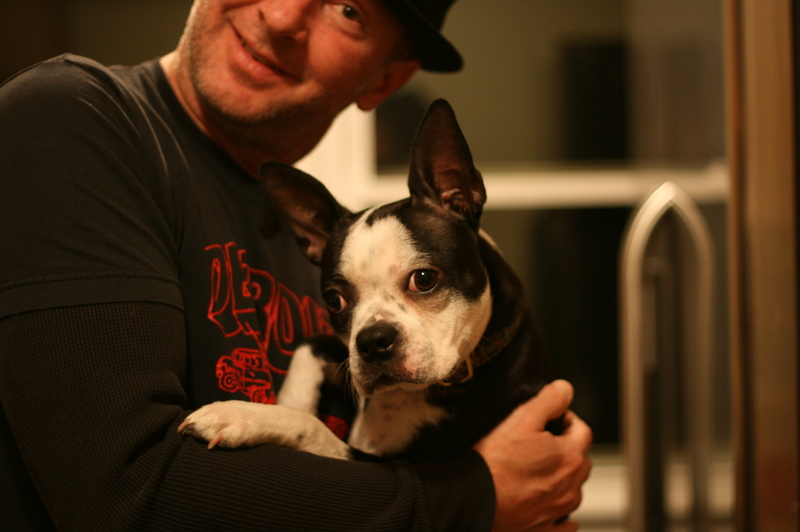 Marumodern had a hard time taking direction as my sous chef. Cheese comes later. 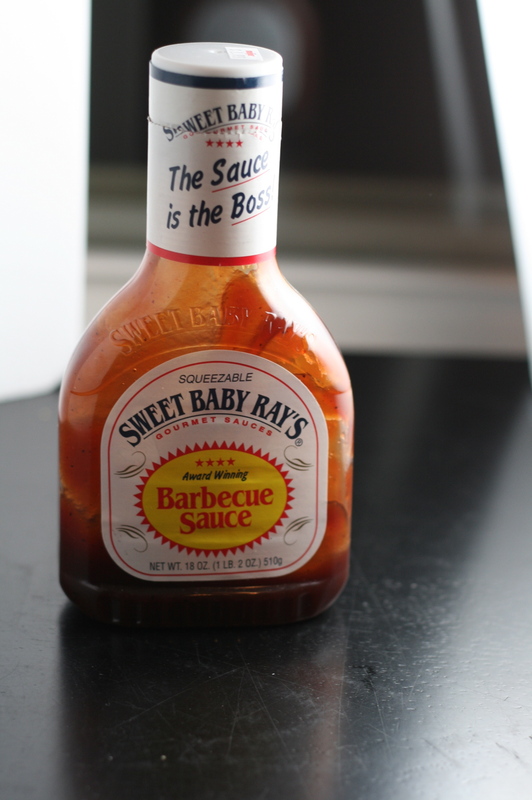 My turn-to store bought barbeque sauce…Sweet Baby Ray’s. Delicious. 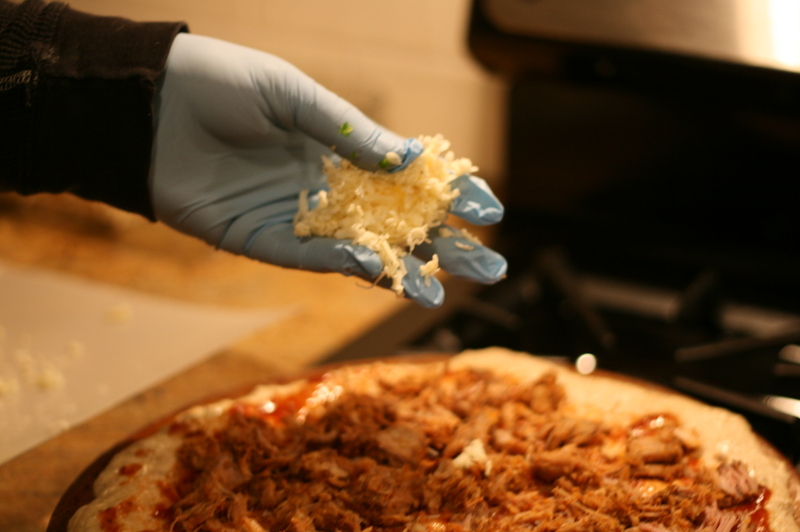 So here’s how easy Memphis Pulled Pork Pizza is. Dough. (I salt and pepper the dough a little. Olive oil the crust and season that with a little garlic powder.) Sauce. Meat (pulled pork.) Cheese (Monterey Jack or Pepper Jack). Minced fresh jalapeno. Diced, seeded tomato. Diced bacon. Grated Parmesan. Bake it. Sprinkle with some fresh, chopped cilantro. Eat. A member of the Blue Man Group came to lend a hand mincing up jalapeno. I’m a wimp and really don’t enjoy jalapeno oil in my eye when I forget later that I was dicing them. 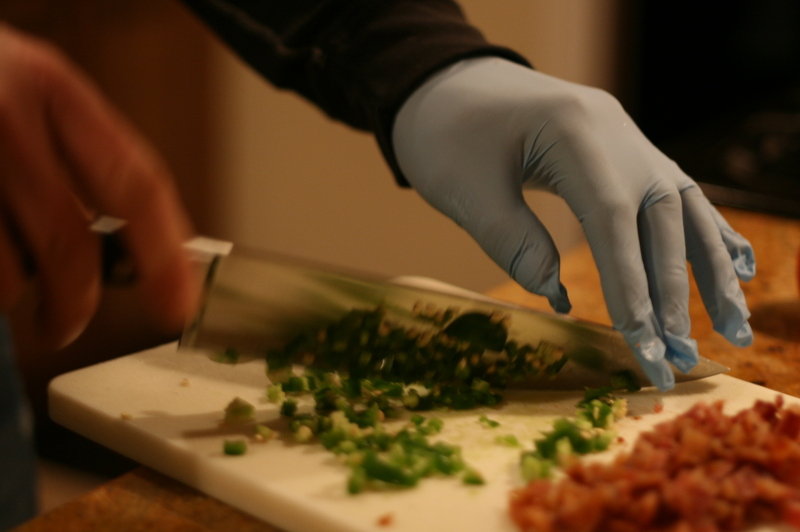 Wear a glove if you are a wimp like me so the jalapeno oil doesn’t get you later. Even hand washing doesn’t seem to wash it all off. Voila. Meat. We are easily amused at my house. The blue glove was too much for this photographer. 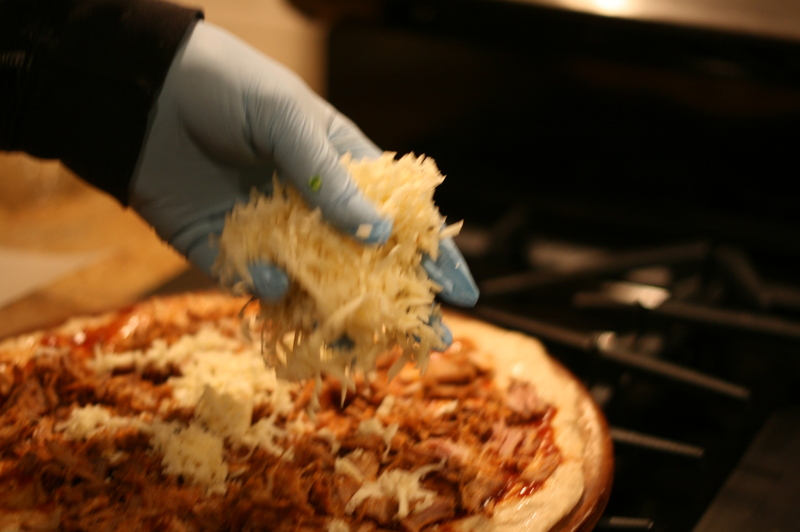 And now the blue hand will sprinkle the cheese. More cheese. Cheese Good. Laughter. Camera Shake. My apologies. Topped with jalapeno, bacon, some diced (seeded) tomatoes and now some fresh grated parm. And now bake for about 14 minutes. Watch for your crust to golden up. Yeast this is your big final moment! Get baking. 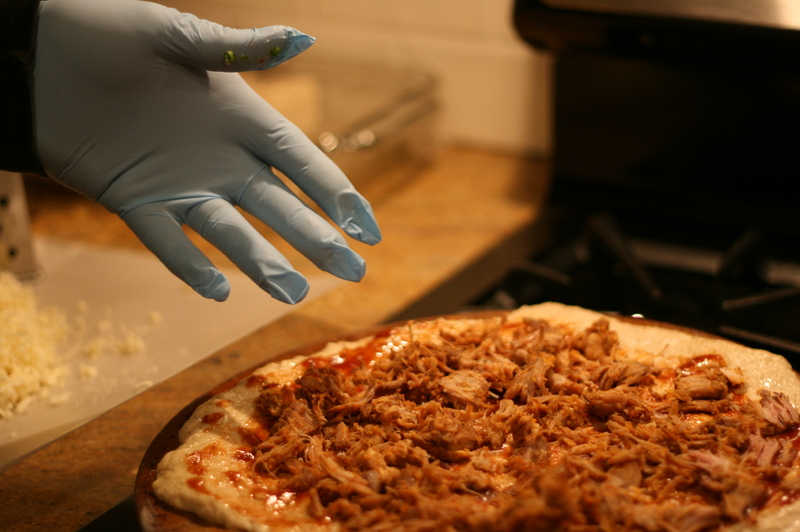 When the pizza comes out of the oven, brush the crust with some olive oil.Sprinkle with some fresh, chopped cilantro. Cut it up. Take 20 more pictures and then Enjoy! 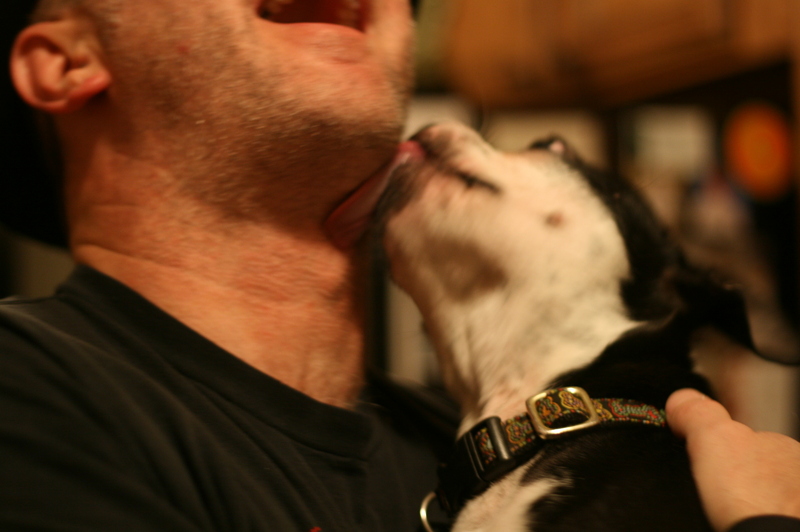 Love up the puppy while the pizza cooks. We are teaching the puppy modeling poses so she can start to earn her keep. She hasn't quite got it licked yet. Brush crust with olive oil out of the oven. Sprinkle with fresh chopped cilantro. Maybe some fresh ground pepper. Enjoy. Sadly, my winter break is now over unless someone has an “in” with Mother Nature and can order up a good Midwestern (school-closing) blizzard in the next 24 hours. I hope to be able to keep up with a regular posting schedule. I appreciate all the great feedback and referrals. Thank you lovely folks! Check back soon: Up next the dessert that almost caused violence. Dark Chocolate Creme Brulee. 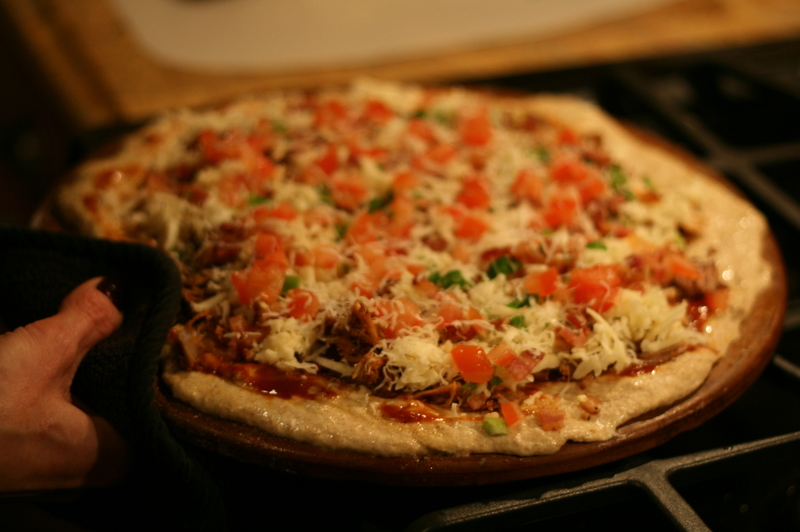 This entry was posted in Bread & Baking, Freezer Friendly, Uncategorized and tagged bacon, baking, homemade, pizza, pizza dough, pulled pork. Bookmark the permalink.